Background: The association between occupational exposure and COPD reported previously has mostly been derived from studies relying on self-reported exposure to vapors, gases, dust, or fumes (VGDF), which could be subjective and prone to biases. The aim of this study was to assess the strength of association between exposure and COPD from studies that derived exposure by job exposure matrices (JEMs). Methods: A systematic search of JEM-based occupational COPD studies published between 1980 and 2015 was conducted in PubMed and EMBASE, followed by meta-analysis. Meta-analysis was performed using a random-effects model, with results presented as a pooled effect estimate with 95% confidence intervals (CIs). The quality of study (risk of bias and confounding) was assessed by 13 RTI questionnaires. Heterogeneity between studies and its possible sources were assessed by Egger test and meta-regression, respectively. Results: In all, 61 studies were identified and 29 were included in the meta-analysis. Based on JEM-based studies, there was 22% (pooled odds ratio =1.22; 95% CI 1.18–1.27) increased risk of COPD among those exposed to airborne pollutants arising from occupation. Comparatively, higher risk estimates were obtained for general populations JEMs (based on expert consensus) than workplace-based JEM were derived using measured exposure data (1.26; 1.20–1.33 vs 1.14; 1.10–1.19). Higher risk estimates were also obtained for self-reported exposure to VGDF than JEMs-based exposure to VGDF (1.91; 1.72–2.13 vs 1.10; 1.06–1.24). Dusts, particularly biological dusts (1.33; 1.17–1.51), had the highest risk estimates for COPD. Although the majority of occupational COPD studies focus on dusty environments, no difference in risk estimates was found for the common forms of occupational airborne pollutants. Conclusion: Our findings highlight the need to interpret previous studies with caution as self-reported exposure to VGDF may have overestimated the risk of occupational COPD. The importance of occupational exposure as a cause of COPD has been recognized for decades.1–3 A recent systematic review concluded that there is strong and consistent evidence to support a causal association between occupational exposure(s) and COPD.4 Recent reviews have identified associations between a few specific occupational pollutants, mainly dusts (silica, wood, coal, cotton, and grain) and fumes (rubber, welding, and cadmium), and the development of COPD.4,5 However, there is still an ongoing debate on the relative importance of the different occupational pollutants forms (vapors, gases, dusts, fumes, fibers, and mists) to which individuals may be exposed at work; this information would be valuable when identifying suitable workplace interventions and when planning adjustments at work for individuals either at risk of developing work-related COPD or when improving work ability in individuals with COPD. The assessment of occupational exposure requires collection of personal exposure data, which are often not available and, where present, are usually limited to a few industries and substances. In the absence of measured exposure data, epidemiological studies have relied on self-reported exposure (questionnaires) to either specific substances6–8 or a combination of airborne substances, typically vapors, gases, dusts, or fumes (VGDF),9–11 which could be prone to recall bias. Over the past two decades, job exposure matrices (JEMs) have been increasingly used to estimate occupational exposures, particularly in large-scale epidemiological studies, as they are relatively easy to use and are economic. The majority of JEMs are based on general population12,13 and rely on expert knowledge of industries, work environments, and determinants of occupational exposure to assign exposures to a standard job classification coding system. A few work-based JEMs have also been developed, which make use of actual measured data (current or historical) from particular work sites for the population of interest.14,15 Regardless of JEM types their use has allowed the assignation of exposure to specific substances as well as the full range of individual pollutant forms (vapors, gases, dusts, fumes, fibers, and mists) found in occupational settings. Do different JEM types (based on general population and workplace) provide similar risk estimates for different pollutant forms including the common aggregate VGDF? Are pollutant forms such as gases, vapors, fumes, and fibers as important as dusts in the development of occupational COPD? Is the strength of association between different COPD phenotypes and occupational airborne pollutants consistent in JEM-based studies? Papers published from January 1, 1980, to December 13, 2015, were identified through a systematic literature search in PubMed and EMBASE. Search terms used for the initial search are shown in Table S1. Bibliographies of peer-reviewed publications on the subject were also screened to ensure that no relevant papers have been missed during our original searches. We used a multistage iterative process to reduce the initial search pool of citations down to a final selection as shown in Figure 1. OPK and SS initially screened the titles and abstracts of all publications identified. The search was limited to human studies and English language. We included studies on adults that used a JEM to assign exposure to jobs with respiratory outcomes (COPD, chronic bronchitis, and breathlessness) only. We applied a broad definition of COPD (diagnosed by either a physician or on the basis of spirometry) and chronic bronchitis (those diagnosed by physician or those who completed Medical Research Council questionnaires on chronic bronchitis). The definitions used are shown in Table S2 for each study. Studies on environmental (outdoor or domestic) exposure were excluded unless the exposure occurred as part of an occupation, such as in traffic wardens or car park attendants. Following studies were excluded: 1) studies on respiratory health effects due to smoking unless they are related to the workplace, for example bar staff, and 2) studies on respiratory health effects from household air pollution, for example burning of solid fuel. Case reports and articles not related to occupation and the prespecified respiratory outcomes were also excluded. Figure 1 Flowchart of the number of articles in different stages of the selection strategy. Abbreviation: JEMs, job exposure matrices. Information from selected publications were extracted independently by two reviewers SS and SSS using a predefined template on the following: gender, study population (general population or workplace based), study design, types of occupational airborne pollutants (specific substances), formulations (paints and adhesives) and the six broader forms of pollutants (vapors, gases, dusts, fumes, fibers, and mists), JEM type (whether based on general population or workplace), level of exposures assigned by the JEM (low, medium, or high), confounder(s) adjusted for, respiratory outcomes, and risk estimates. Publication(s) with any disagreement in data extraction was further reviewed by OPK. Data on effect size and 95% confidence intervals (CIs) both before and after adjustment for confounders were extracted, but only those data sets that adjusted for confounders including smoking were used in the meta-analysis. For studies conducted in the workplace, it was noted whether workplace-measured exposure data were used to inform the development of the JEM. All exposure estimates derived using a specified expert JEM were labeled as JEM based. Risk estimates for self-reported exposures were also recorded (where available) in the selected JEM-based studies. The majority of JEMs provided respiratory risk estimates for one of the six broad forms of pollutants: vapors, gases, dusts, fumes, fibers, or mists, or the aggregate VGDF (exposed to one of the four pollutant forms). In cases where JEMs provided risk estimates for specific airborne chemical/materials, those were allocated by SS and OPK to one of the six broad forms of pollutants. For example, JEM-based risk estimates for paints, cement, and asbestos were classified as exposed to vapors, dusts, and fibers, respectively. All eligible studies were pooled, and sensitivity analysis was conducted to assess the impact of methodological approaches (study design, study population, JEM types, exposure to VGDF [self-reported and JEM based], exposure to different individual pollutant forms, and exposure duration estimates [current job and cumulative]) by grouping them into different subgroups.19 We used natural logarithms of odds ratio (OR) and the associated standard errors to estimate the pooled effect size of all studies and the subgroups. Within-group heterogeneity was assessed using Q-tests and/or I2 statistics.20 As there was huge heterogeneity among studies, we used random-effects model to calculate the pooled effect estimates. We assessed publication bias by funnel plots and Egger regression.21 Meta-regression was used to explore the sources of heterogeneity, including gender, study design, JEM types, exposure period, and pollutant forms. All analyses were performed using STATA (version 13; STATA, College Station, TX, USA). A total of 61 articles were identified from the initial search and an additional 5 articles identified from screening the reference lists of previously published studies. 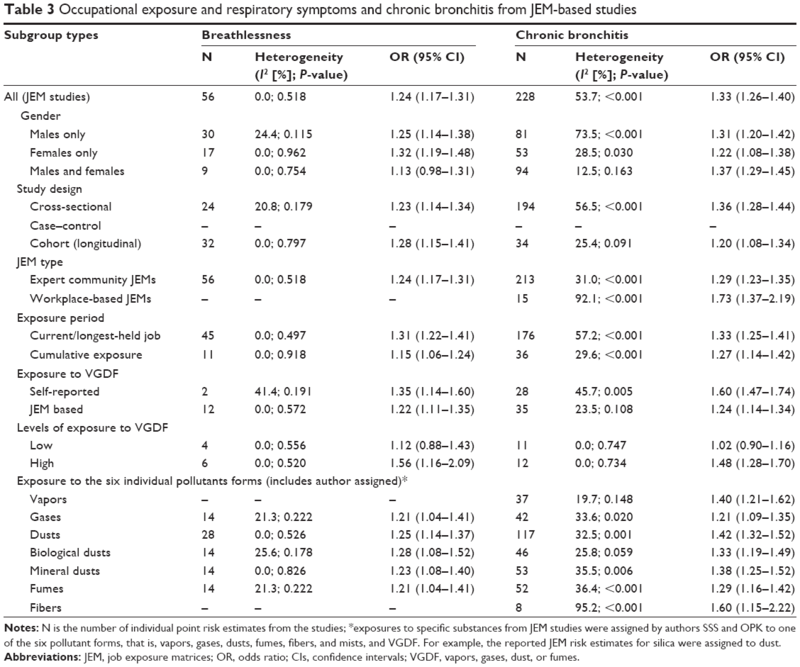 Of them, 24 were excluded from further review as they were either not related to respiratory outcomes of interest or did not use a JEM to assign occupational exposures (Figure 1). Detailed data for the 42 studies were extracted (Table S2). We included 29 studies for meta-analysis; 13 were excluded which either did not meet the inclusion criteria or did not provide adjusted effect size estimates for meta-analysis. Most of the studies had low risk of bias across the domains (Table 1), although high risk of bias was noted in confounding studies, particularly in studies without adjustment for environmental tobacco smoke, and an unclear risk of detection bias was noted in the studies that did not clearly state if assessment of exposure was blinded where possible. Notes: •, not applicable; +, low risk of bias; −, high risk of bias; ?, unclear risk of bias. List of the 13 questions from the RTI Item Bank are as follows: 1. Do the inclusion/exclusion criteria vary across the comparison groups of the study? 2. Does the strategy for recruiting participants into the study differ across groups? 3. Is the selection of the comparison group inappropriate? 4. Does the study fail to account for important variations in the execution of the study from the proposed protocol? 5. Was the assessor not blinded to the outcome, exposure, or intervention status of the participants? 6. Were valid and reliable measures not used or not implemented consistently across all study participants to assess inclusion/exclusion criteria, intervention/exposure outcomes, participant benefits and harms, and potential confounders? 7. Was the length of follow-up different across study groups? 8. In cases of missing data (eg, overall or differential loss to follow-up for cohort studies or missing exposure data for case–control studies), was the impact not assessed (eg, through sensitivity analysis or other adjustment method)? 9. Are any important primary outcomes missing from the results? 10. Are any important harms or adverse events that may be a consequence of the intervention/exposure missing from the results? 11. Did the study fail to balance the allocation between the groups or match groups (eg, through stratification, matching, propensity scores)? 12. Were important confounding variables not taken into account in the design and/or analysis (eg, through matching, stratification, interaction terms, multivariate analysis, or other statistical adjustment such as instrumental variables)? 13. Are results believable taking study limitations into consideration? A range of outcomes were reported in these 29 studies, including shortness of breath (n=5), chronic bronchitis (n=15), COPD diagnosed by physician (n=10), and spirometry-defined COPD (n=17). Altogether these papers provided 575 individual risk estimates for one of the following pollutant forms: vapors, gases, dusts, fumes, fibers, and VGDF. Dust was the most commonly reported form of pollutant (n=312), followed by fumes (n=133), with fibers and fumes being least common (n<20). In addition, nine studies included risk estimates for self-reported exposures to VGDF. The main results are shown in Table 2. Overall, there was little but significant heterogeneity among the studies (I2=46.8%, P<0.001), reducing only slightly (to 39.6%) when restricted to studies that defined COPD by spirometry. The pooled risk estimate was significantly higher (P<0.001) among the studies that used self-reported physician diagnosis (1.36; 95% CI 1.26–1.47) compared to those that defined COPD by spirometry (1.16; 1.12–1.20), giving an overall 22% increase in odds (95% CI 18%–27%) across all studies. Females tended to have higher COPD risk than males, and likewise for general population–based studies (vs workplace) and case–control studies (vs other designs). We also observed a 28% higher risk for occupational exposures based on current/longest-held job compared to cumulative historical exposure (19%). Higher risk estimates were reported in studies that used expert general population JEMs (1.26; 1.20–1.33) compared to work-based JEMs (1.14; 1.10–1.19) derived using measured exposure data. Notes: N is the number of individual point risk estimates from the studies; *compared to nonexposed individuals; †exposures to specific substances from JEM studies were assigned by authors SS and OPK to one of the six pollutant forms, that is, vapors, gases, dusts, fumes, fibers, and mists, and VGDF. For example, the reported JEM risk estimates for silica were assigned to dust. Abbreviations: JEM, job exposure matrices; OR, odds ratio; CIs, confidence intervals; VGDF, vapors, gases, dust, or fumes. JEM-based studies provided more modest risk estimate (1.10; 1.06–1.24) compared to those with self-reported VGDF exposure (1.91; 1.72–2.13). Exposure levels among JEM-based studies showed a dose–response effect. As for the individual pollutants forms, no material difference was found for VGDF. 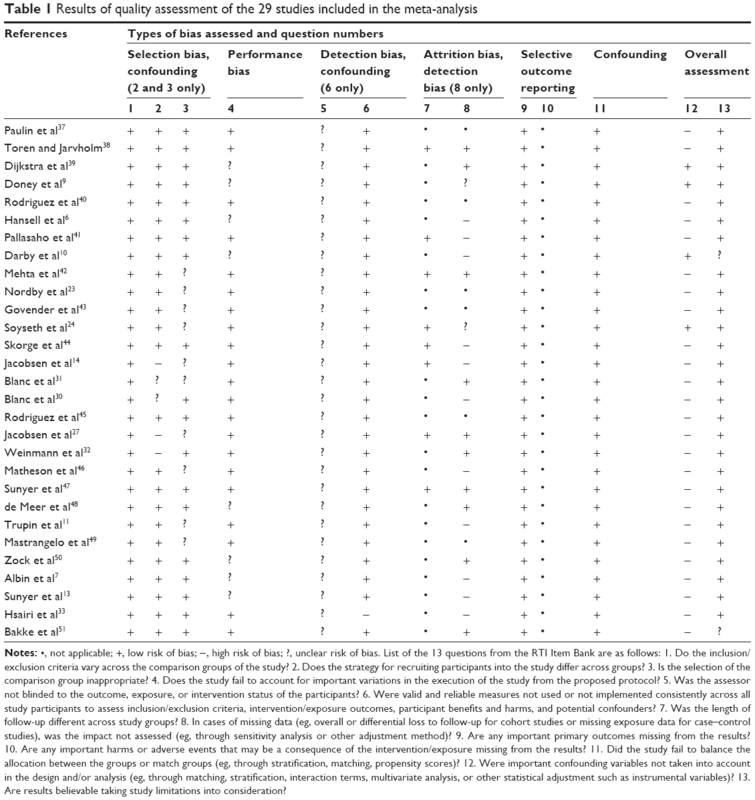 Biological dusts (1.33; 1.17–1.51) produced higher risk estimates than mineral dusts (1.07; 1.05–1.09; Table 2). Substantial heterogeneity was observed in studies reporting chronic bronchitis as an outcome, but not for breathlessness (Table 3). Similar to COPD, the pooled effect size for breathlessness and chronic bronchitis was higher among those with current/longest-held job compared to cumulative historical exposure. Risk estimates from JEM-based studies were also attenuated compared to those using self-reported exposures. Similarly, there was no significant difference in terms of the magnitude of association across different forms of pollutants. However, studies using workplace-based JEMs gave a higher pooled effect estimate (1.73; 1.37–2.19) for chronic bronchitis compared to those that used JEMs for the community (1.29; 1.23–1.35). Notes: N is the number of individual point risk estimates from the studies; *exposures to specific substances from JEM studies were assigned by authors SSS and OPK to one of the six pollutant forms, that is, vapors, gases, dusts, fumes, fibers, and mists, and VGDF. For example, the reported JEM risk estimates for silica were assigned to dust. Funnel plots and Egger tests showed some evidence of publication bias for studies with self-reported physician-diagnosed COPD (bias =0.64, P<0.001), chronic bronchitis (bias =0.36, P=0.022), spirometry-diagnosed COPD (bias =0.50, P<0.001; Figure 2), and combined COPD (bias =0.63, P<0.001; Figure 3) as outcomes. However, the plots suggested no publication bias for breathlessness (bias =0.37, P=0.135). 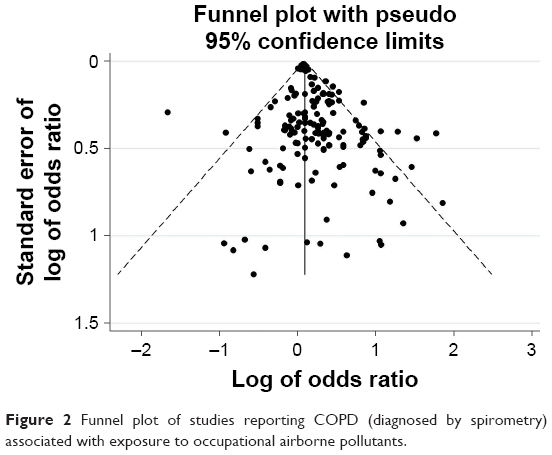 Figure 2 Funnel plot of studies reporting COPD (diagnosed by spirometry) associated with exposure to occupational airborne pollutants. 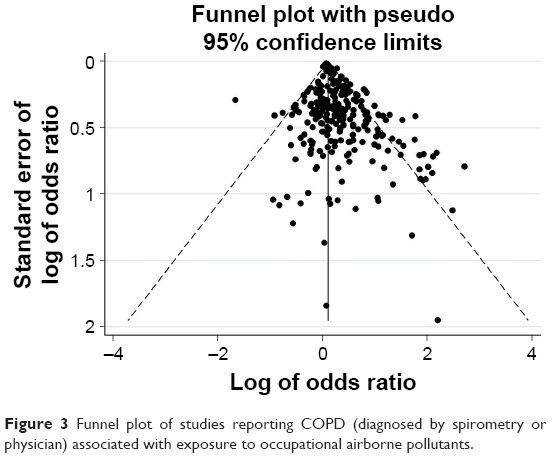 Figure 3 Funnel plot of studies reporting COPD (diagnosed by spirometry or physician) associated with exposure to occupational airborne pollutants. We further assessed the contribution of various factors (Table 2) toward heterogeneity by meta-regression. 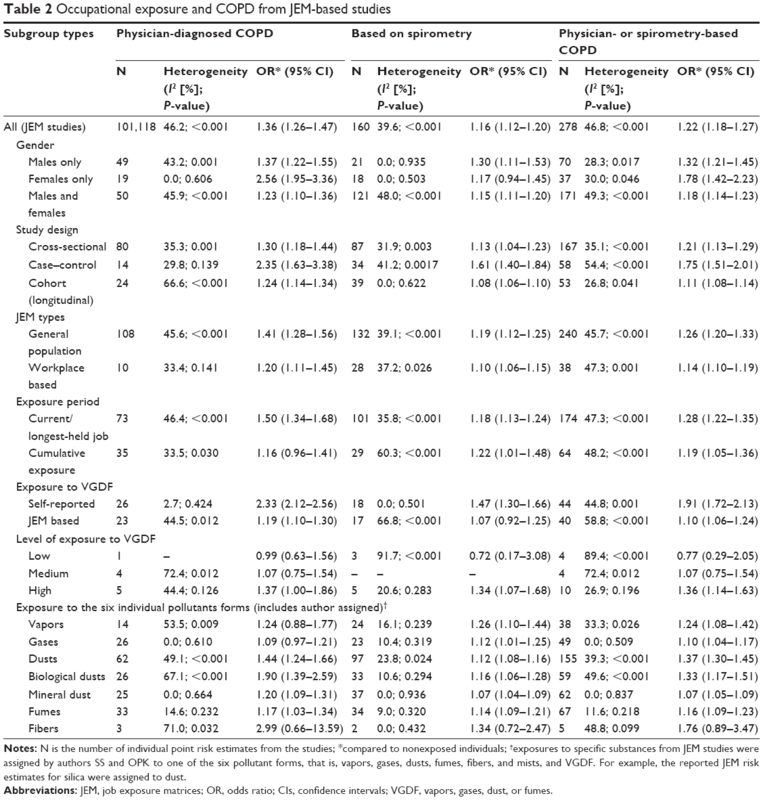 For studies reporting self-reported physician diagnosis of COPD, the factors contributing to heterogeneity were gender (coefficient =−0.102, P=0.046), publication year (−0.040, P<0.001), and JEM types (0.093, P=0.053) as was study population (0.256, P=0.002) and JEM types (0.256, P=0.002) for chronic bronchitis. None of the examined factors significantly contributed toward the heterogeneity for COPD defined by spirometry criteria or for shortness of breath. To our knowledge, this is the first systematic review and meta-analysis of peer-reviewed studies that have used different population JEMs to assess the association between the types of occupational airborne pollutants and COPD phenotypes. Overall occupational exposure to airborne pollutants as assessed by JEMs showed a 22% increased risk of COPD (diagnosed by physician or based on spirometry), which was lower compared to the risk estimate obtained by self-reported exposures. Although there was no significant difference in COPD risk estimates for individual forms of pollutants such as vapors, gases, dusts, and fumes, exposure to biological dusts appeared to confer a higher risk than that to mineral dusts. Occupational exposure has been shown to be associated with COPD,1–4 but information on the role of different airborne pollutants is limited to few specific substances and industries. This may be partly due to the absence of reliable measured personal exposure data and has been addressed (over the past two decades) by the development and application of JEMs to assign occupational exposures in COPD epidemiological studies. Nevertheless, the majority of studies on occupational COPD to date have focused mainly on exposure to dusts and fumes with little information on other forms of airborne pollutants such as gases, vapors, fibers, and mists to which individuals may be exposed either alone or more commonly in combination with other pollutant forms. General population–based studies often include the following question: In this job, are you exposed to VGDF? ; similarly, general population–based JEMs developed by experts assign exposure to VGDF to different job types or standardized international job codes. In this pooled analysis, the risk for self-reported exposure to VGDF was 80% higher compared to that estimated by expert general population–based JEMs. This overestimation in self-reported exposures to VGDF may be due to misinterpretation by study respondents as being exposed to any chemical substance at work, by all routes such as by dermal and inhalation routes. The analysis of the JEM types also shows that JEMs derived using measured exposure data produced more modest estimates (1.14; 1.10–1.19) for occupational COPD compared with the general population–based JEMs (1.26; 1.20–1.33), which are based on expert knowledge, experience, and consensus. A recent review and meta-analysis of population-based studies which was limited to studies using the ALOHA JEM reported that low exposure to mineral dust had 17% increased risk of lung function defined COPD but surprisingly no association with high exposure to mineral dust.36 Although measured exposure data are only available in a limited number of COPD epidemiological studies, this finding further supports the need for reliable industry-based exposure estimates and the need to validate expert-derived JEMs against measured data. Although majority of substances reported in the literature to be associated with occupational COPD are mainly dusts (silica, metals, wood, and coal) and fumes (diesel), such as particulates, surprisingly we found no major difference when comparing risk estimates for different pollutant forms. This may be because of a lack of power, reflected by the fact that the majority (71%) of risk estimates for COPD from JEM studies were for dust or fumes, 26% of estimates were for gases and vapors, and only a few for fibers and mists. It is also important to note that the majority of individuals in industrial workplaces are exposed to a combination of pollutants rather than a single substance. For instance, a welder is exposed to metal fumes as well as inorganic gases (eg, ozone) and a carpenter may be exposed to organic solvents (adhesives and paints) as well as wood dust. It is thus important that future COPD JEM studies report and investigate the range and combination of pollutants to which individuals may be exposed over their typical work shift as well as common pollutants associated with their job. Little is known about the importance of the interaction of different forms of pollutants in occupational COPD, which was not possible to be investigated in this study. Of the different pollutants, dusts appeared to be the most important. A number of JEM studies in particular those that used the ALOHA JEM have provided risk estimates for both mineral and biological dusts. Overall (for all population JEMs), biological dusts produced higher risk estimates for COPD compared with mineral dusts (metals, silica, and cement). This finding is contrast to the findings of Alif et al,36 which did not find any association for the ALOHA JEM-based studies. JEM studies other than those using the ALOH JEM tend to provide risk estimates for all dusts ie do not differentiate between dust types or include organic dusts within the definition of biological dusts. The role and mechanism of biological dusts in COPD warrants further investigation. For chronic occupational diseases such as COPD, estimation of cumulative occupational exposures would seem logical, but most of the JEMs assessed exposure for the current or longest-held job and few studies provided estimates for cumulative exposures. Nevertheless, cumulative exposure estimates are only possible where historical measurements of exposure is available for defined occupational groups or where JEMs take account of different exposures over decades. This presents a challenge for future studies on occupational COPD. Although this review attempts to capture all relevant information on occupational exposures and COPD from reported JEM studies, there is considerable variability between studies as demonstrated by the heterogeneity for both exposure and different definitions of COPD. This variability is expected as all studies included in the meta-analysis are observational by design due to the chronic nature of COPD and the fact that majority of the studies attempt to estimate past occupational exposures and investigate associations between exposures and chronic effect. In the absence of randomized controlled trials for meta-analysis, it is important to assess and understand possible sources of heterogeneity. The exposure heterogeneity may be explained by different definitions and guidelines used by experts when developing general population JEMs that are often not explained in detail. For instance, only limited information is often available on how exposed groups are defined and factors used in assigning the levels of exposure (low, medium, high). It is also important to note that when risk of exposure is assessed to a particular pollutant, for example dusts, the reference category is usually defined as nonexposed to dusts but these individuals may be exposed to other different combination of airborne pollutants such as gases, vapors, and mists. In the case of workplace-based JEMs, exposed and nonexposed, are usually well defined, but the reference group may vary between studies which may affect the risk estimates. For COPD outcomes, large variation exists depending on the definition (diagnosed by doctor, symptoms, based on spirometry and mortality); however, in case of spirometry, majority (70%) of studies stated use of post-bronchodilators or followed the American Thoracic Society or European Respiratory Society spirometry guidelines. A further source of heterogeneity that is to be introduced in this review is the use of ORs rather than true relative risk, that is, the size of the effect may be overestimated when prevalence is high. However, majority of studies cited in this review were case–control or cross-sectional studies for which the common measure of effect size was OR. A further limitation of this review is that the COPD risk estimates for self-reported exposures were limited to those reported only in JEM-based studies, that is, occupational COPD studies that did not use JEMs but provided risk estimates based on self-reported occupational exposures were not included in this review. Majority of the above limitations are a consequence of meta-analysis of observational studies, that is combining diverse study designs and populations and calculating of single summary estimates of exposure which needs to be interpreted cautiously. In summary, this review shows that while the majority of studies on occupational COPD focus on dusty environments, no difference in risk estimates was found for the common forms of occupational airborne pollutants such as vapors, gases, dusts, and fumes. However, biological dusts were associated with higher risks of occupational COPD than mineral dusts. The review also shows that self-reported exposure to VGDF provides higher risk estimates for occupational COPD compared to exposure assigned using JEMs. The authors thank Dr Nuredin Mohamed for updating the literature searches. This study was funded by the University of Birmingham, UK. Conception: SS, OPK, JGA; study design: all authors; data collection: SS, OPK, SSS; analysis and interpretation: all authors; writing of manuscript, revisions, and approval: all authors. None of the authors has a financial relationship with a commercial entity that has interest in the subject of this manuscript. The authors report no conflicts of interest in this work. Becklake MR. Chronic airflow limitation: its relationship to work in dusty occupations. Chest. 1985;88(4):608–617. Balmes J, Becklake M, Blanc P, et al. American Thoracic Society Statement: occupational contribution to the burden of airway disease. Am J Respir Crit Care Med. 2003;167(5):787–797. Eisner MD, Anthonisen N, Coultas D, et al. An official American Thoracic Society public policy statement: novel risk factors and the global burden of chronic obstructive pulmonary disease. Am J Respir Crit Care Med. 2010;182(5):693–718. Omland O, Wurtz ET, Aasen TB, et al. 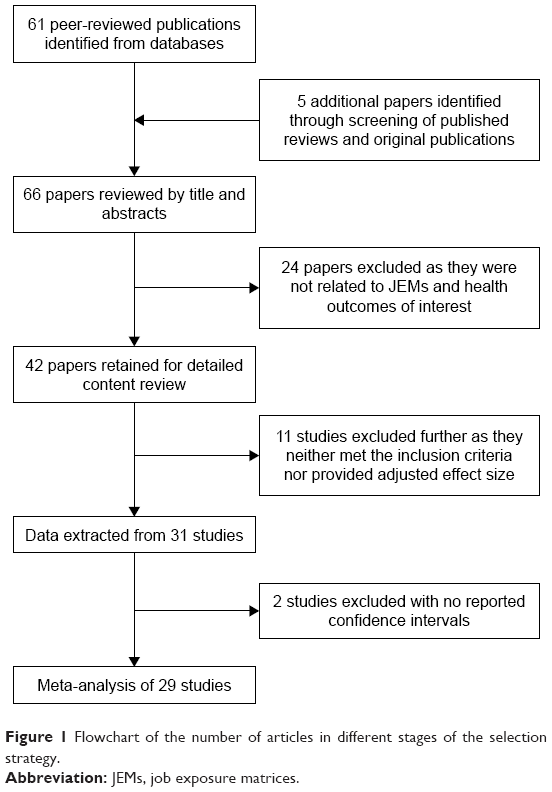 Occupational chronic obstructive pulmonary disease: a systematic literature review. Scand J Work Environ Health. 2014;40(1):19–35. Cullinan P. Occupation and chronic obstructive pulmonary disease (COPD). Br Med Bull. 2012;104:143–161. Hansell A, Ghosh RE, Poole S, et al. Occupational risk factors for chronic respiratory disease in a New Zealand population using lifetime occupational history. J Occup Environ Med. 2014;56(3):270–280. Albin M, Engholm G, Hallin N, Haqmar L. Impact of exposure to insulation wool on lung function and cough in Swedish construction workers. Occup Environ Med. 1998;55(10):661–667. Post WK, Heederik D, Kromhout H, Kromhout D. Occupational exposures estimated by a population specific job exposure matrix and 25 year incidence rate of chronic nonspecific lung disease (CNSLD): the Zutphen Study. Eur Respir J. 1994;7(6):1048–1055. Doney B, Hnizdo E, Graziani M, et al. Occupational risk factors for COPD phenotypes in the Multi-Ethnic Study of Atherosclerosis (MESA) Lung Study. COPD. 2014;11(4):368–380. Darby AC, Waterhouse JC, Stevens V, et al. Chronic obstructive pulmonary disease among residents of an historically industrialised area. Thorax. 2012;67(10):901–907. Trupin L, Earnest G, San Pedro M, et al. The occupational burden of chronic obstructive pulmonary disease. Eur Respir J. 2003;22(3):462–469. Pannett B, Coggon D, Acheson ED. A job-exposure matrix for use in population based studies in England and Wales. Br J Ind Med. 1985;42(11):777–783. Sunyer J, Kogevinas M, Kromhout H, et al. Pulmonary ventilatory defects and occupational exposures in a population-based study in Spain. Spanish Group of the European Community Respiratory Health Survey. Am J Respir Crit Care Med. 1998;157(2):512–517. Jacobsen G, Schlunssen V, Schaumburg I, Siqsqaard T. Increased incidence of respiratory symptoms among female woodworkers exposed to dry wood. Eur Respir J. 2009;33(6):1268–1276. Johnsen HL, Bugge MD, Foreland S, Kjuus H, Kongerud J, Søyseth V. Dust exposure is associated with increased lung function loss among workers in the Norwegian silicon carbide industry. Occup Environ Med. 2013;70(11):803–809. Viswanathan M, Berkman ND, Dryden DM, Hartling L; AHRQ Methods for Effective Health Care. Assessing Risk of Bias and Confounding in Observational Studies of Interventions or Exposures: Further Development of the RTI Item Bank. Rockville, MD: Agency for Healthcare Research and Quality (US); 2013. Margulis AV, Pladevall M, Riera-Guardia N, et al. Quality assessment of observational studies in a drug-safety systematic review, comparison of two tools: the Newcastle-Ottawa Scale and the RTI item bank. Clin Epidemiol. 2014;6:359–368. Kurmi OP, Semple S, Simkhada P, Smith WC, Ayres JG. COPD and chronic bronchitis risk of indoor air pollution from solid fuel: a systematic review and meta-analysis. Thorax. 2010;65(3):221–228. Borenstein M, Hedges LV, Higgins JPT, Rothstein HR. Introduction to Meta-Analysis. Chichester, UK: Wiley; 2009. Bugge MD, Foreland S, Kjaerheim K, Eduard W, Martinsen JI, Kjuus H. Mortality from non-malignant respiratory diseases among workers in the Norwegian silicon carbide industry: associations with dust exposure. Occup Environ Med. 2011;68(12):863–869. Nordby KC, Fell AK, Noto H, et al. Exposure to thoracic dust, airway symptoms and lung function in cement production workers. Eur Respir J. 2011;38(6):1278–1286. Soyseth V, Johnsen HL, Bugge MD, Hetland SM, Kongerud J. Prevalence of airflow limitation among employees in Norwegian smelters: a longitudinal study. Occup Environ Med. 2011;68(1):24–29. Fritschi L, Sim MR, Forbes A, et al. Respiratory symptoms and lung-function changes with exposure to five substances in aluminium smelters. Int Arch Occup Environ Health. 2003;76(2):103–110. Johnsen HL, Hetland SM, Benth JS, Kongerud J, Søyseth V. Dust exposure assessed by a job exposure matrix is associated with increased annual decline in FEV1: a 5-year prospective study of employees in Norwegian smelters. Am J Respir Crit Care Med. 2010;181(11):1234–1240. Jacobsen G, Schlunssen V, Schaumburg I, Taudorf E, Sigsgaard T. Longitudinal lung function decline and wood dust exposure in the furniture industry. Eur Respir J. 2008;31(2):334–342. Bergdahl IA, Toren K, Eriksson K, et al. Increased mortality in COPD among construction workers exposed to inorganic dust. Eur Respir J. 2004;23(3):402–406. Burkhart G, Schulte PA, Robinson C, Sieber WK, Vossenas P, Ringen K. Job tasks, potential exposures, and health risks of laborers employed in the construction industry. Am J Ind Med. 1993;24(4):413–425. Blanc PD, Eisner MD, Earnest G, et al. Further exploration of the links between occupational exposure and chronic obstructive pulmonary disease. J Occup Environ Med. 2009;51(7):804–810. Blanc PD, Iribarren C, Trupin L, et al. Occupational exposures and the risk of COPD: dusty trades revisited. Thorax. 2009;64(1):6–12. Weinmann S, Vollmer WM, Breen V, et al. COPD and occupational exposures: a case–control study. J Occup Environ Med. 2008;50(5):561–569. Hsairi M, Kauffmann F, Chavance M, Brochard P. Personal factors related to the perception of occupational exposure: an application of a job exposure matrix. Int J Epidemiol. 1992;21(5):972–980. Heederik D, Pouwels H, Kromhout H, Kromhout D. Chronic non-specific lung disease and occupational exposures estimated by means of a job exposure matrix: the Zutphen Study. Int J Epidemiol. 1989;18(2):382–389. Heederik D, Kromhout H, Burema J, Kromhout D. Occupational exposure and 25-year incidence rate of non-specific lung disease: the Zutphen Study. Int J Epidemiol. 1990;19(4):945–952. Alif SM, Dharmage SC, Bowatte G, et al. Occupational exposure and risk of chronic obstructive pulmonary disease: a systematic review and meta-analysis. Expert Rev Respir Med. 2016;10(8):861–872. Paulin LM, Diette GB, Blanc PD, et al. Occupational exposures are associated with worse morbidity in patients with chronic obstructive pulmonary disease. Am J Respir Crit Care Med. 2015;191(5):557–565. Toren K, Jarvholm B. Effect of occupational exposure to vapors, gases, dusts, and fumes on COPD mortality risk among Swedish construction workers: a longitudinal cohort study. Chest. 2014;145(5):992–997. Dijkstra AE, de Jong K, Boezen HM, et al. Risk factors for chronic mucus hypersecretion in individuals with and without COPD: influence of smoking and job exposure on CMH. Occup Environ Med. 2014;71(5):346–352. Rodriguez E, Ferrer J, Zock JP, et al. Lifetime occupational exposure to dusts, gases and fumes is associated with bronchitis symptoms and higher diffusion capacity in COPD patients. PLoS One. 2014;9(2): e88426. Pallasaho P, Kainu A, Sovijarvi A, Lindqvist A, Piirilä PL. Combined effect of smoking and occupational exposure to dusts, gases or fumes on the incidence of COPD. COPD. 2014;11(1):88–95. Mehta AJ, Miedinger D, Keidel D, et al. Occupational exposure to dusts, gases, and fumes and incidence of chronic obstructive pulmonary disease in the Swiss Cohort Study on Air Pollution and Lung and Heart Diseases in Adults. Am J Respir Crit Care Med. 2012;185(12):1292–1300. Govender N, Lalloo UG, Naidoo RN. Occupational exposures and chronic obstructive pulmonary disease: a hospital based case–control study. Thorax. 2011;66(7):597–601. Skorge TD, Eagan TM, Eide GE, Gulsvik A, Bakke PS. Occupational exposure and incidence of respiratory disorders in a general population. Scand J Work Environ Health. 2009;35(6):454–461. Rodriguez E, Ferrer J, Marti S, Zock J-P, Plana E, Morell F. Impact of occupational exposure on severity of COPD. Chest. 2008;134(6):1237–1243. Matheson MC, Benke G, Raven J, et al. Biological dust exposure in the workplace is a risk factor for chronic obstructive pulmonary disease. Thorax. 2005;60(8):645–651. Sunyer J, Zock JP, Kromhout H, et al. Lung function decline, chronic bronchitis, and occupational exposures in young adults. Am J Respir Crit Care Med. 2005;172(9):1139–1145. de Meer G, Kerkhof M, Kromhout H, Schouten JP, Heederik D. Interaction of atopy and smoking on respiratory effects of occupational dust exposure: a general population-based study. Environ Health. 2004;3(1):6. Mastrangelo G, Tartari M, Fedeli U, Fadda E, Saia B. Ascertaining the risk of chronic obstructive pulmonary disease in relation to occupation using a case–control design. Occup Med (Lond). 2003;53(3):165–172. Zock JP, Sunyer J, Kogevinas M, Kromhout H, Burney P, Antó JM. Occupation, chronic bronchitis, and lung function in young adults. An international study. Am J Respir Crit Care Med. 2001;163(7): 1572–1577. Bakke PS, Baste V, Hanoa R, Gulsvik A. Prevalence of obstructive lung disease in a general population: relation to occupational title and exposure to some airborne agents. Thorax. 1991;46(12):863–870.